We introduce anti-invariant ξ⊥ -Riemannian submersions from almostcontact manifolds onto Riemannian manifolds. We give an example,investigate the geometry of foliations which are arisen from the definition of a Riemannian submersion and check the harmonicity of suchsubmersions. We also find necessary and sufficient conditions for a special anti-invariant ξ⊥ -Riemannian submersion to be totally geodesic.Moreover, we obtain decomposition theorems for the total manifold ofsuch submersions. Altafini, C. Redundant robotic chains on Riemannian submersions, IEEE Transactions on Robotics and Automation, 20(2), 335-340, 2004. Blair, D. E. Contact manifold in Riemannian geometry,(Lecture Notes in Math., 509, Springer-Verlag, Berlin-New York, 1976). Baird, P., Wood, J. C. Harmonic Morphisms Between Riemannian Manifolds, (London Mathematical Society Monographs, 29, Oxford University Press, The Clarendon Press, Oxford, 2003). Chinea, C. Almost contact metric submersions, Rend. Circ. Mat. Palermo, 43(1), 89–104, 198 Eells, J., Sampson, J. H. Harmonic mappings of Riemannian manifolds, Amer. J. Math., 86, 109–160, 1964. Falcitelli, M., Ianus, S., Pastore, A. M. Riemannian Submersions and Related Topics, (World Scientific, River Edge, NJ, 2004). Gray, A. Pseudo-Riemannian almost product manifolds and submersion, J. Math. Mech., 16, 715–737, 1967. Ianus, S., Pastore A. M. Harmonic maps on contact metric manifolds, Ann. Math. Blaise Pascal, 2(2), 43–53, 1995. O’Neill, B. The fundamental equations of a submersion, Mich. Math. J.,13, 458–469, 1966. Ponge, R. Reckziegel, H. Twisted products in pseudo-Riemannian geometry, Geom. Dedicata, 48(1), 15–25, 1993. Sahin, B. Anti-invariant Riemannian submersions from almost hermitian manifolds, Cent. Eur. J. Math., 8(3), 437–447, 2010. Sasaki, S., Hatakeyama, Y. On differentiable manifolds with contact metric structure, J. Math. Soc. Japan, 14, 249–271, 1961. Watson, B. Almost Hermitian submersions, J. Differential Geometry, 11(1), 147–165, 1976. ISNAD Lee, Jae Won . "Anti-Invariant &#958 &#8869 -Riemannian Submersions fromAlmost Contact Manifolds". 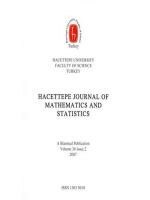 Hacettepe Journal of Mathematics and Statistics 42 / 3 (March 2013): 231-241.